The Long Hello explores the emotional rewards and challenges Cathie Borrie experienced in caring for her mother while she was living with Alzheimer’s disease. Delighted by the things her mother would say, Cathie decided to tape their conversations. She then wrote down their exchanges, weaving in childhood memories, along with reflections on her struggle to maintain her own life during the seven years she spent caring for her mother. The Long Hello reveals how caregiving creates an opportunity to experience rewarding change in a relationship, providing time, amidst the difficulties of illness, for joy, innocence, and profound intimacy to flourish. Written in sparse, beautiful prose, largely in dialogue form, The Long Hello exquisitely captures the intricacies and nuances of a daughter’s relationship with her mother. I’ve had some experience dealing with Alzheimer’s disease with my great-grandmother, grandfather and my beloved, Grandma June, all passing away from the disease. 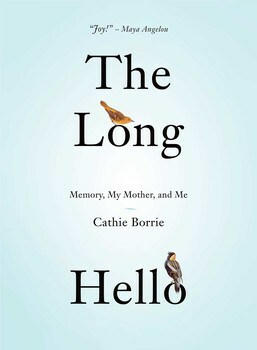 The Long Hello is a memoir written by Cathie Borrie about the years she took care of her mother who had Alzheimer’s disease. I was expecting this book to be really sad and wondered if it would bring back depressing thoughts about my own grandma dealing with this awful disease. I know it was my grandma’s worst nightmare to get Alzheimer’s. She watched her sister struggle through it and she prayed it wouldn’t happen to her. Instead, I found this book to be more of a celebration of life and Cathie’s strong bond with her mother, despite her disease. I found Cathie to be incredibly selfless. She put her mother first and took care of her needs. I can only hope that if I am ever sick that I have a caregiver like Cathie around to stay with me throughout. Cathie spent most of her time with her mom, tending to her needs and just being there for her. They had long conversations and much of them didn’t make sense to me. However, the odd time, you’d see a flash of wisdom and profound insight from Cathie’s mom. I also really enjoyed the flashbacks into Cathie’s past. We are taken through her vivid memories of her brother’s death, her time at boarding school, her relationship with her new dad and more. They were woven perfectly into the book and helped me to better understand both Cathie and her mother’s relationship. My heart went out to childhood Cathie after her brother’s tragic death and when I saw her longing to leave boarding school just to be home with her family. The Long Hello is a quick read; It’s written almost all in dialogue with short paragraphs. I read it in a matter of two sittings. Once I got into it, I couldn’t stop reading. It’s a beautiful, moving memoir and I’m thankful to have had the opportunity to read it. Watch the trailer and find out where to buy The Long Hello by Cathie Borrie. This sounds like a wonderful book. One of my goals for 2015 will be to spend more time reading. I’ll have to pick this one up. Thank you! This is a book I will have to pick up. I, too, am struggling with my Gramma struggling with dementia. It is heart-wrenching to say the least. Thanks for this. It has affected our family as well and will have to look for this book and give it a read! My mother, for the last two years of her life suffer through this terrible disease. Although there was much sadness on my part, I came to grips with it and carried on conversations, knowing that I would have to reintroduce myself the next day. I became “nice girl” to her. I appreciate you taking the time to review the “Long Hello” and am putting it on my reading list. I’ve also read the book – Goodreads win. I like the easy reading format. This sounds like a very touching and moving story. Based on the subject matter I would expect this story to be sad, but I’m glad to hear that it is not. Thank you for sharing this review. Sounds like a book worth reading, I will add it to my list for 2015. This sounds like a very interesting book. It is so hard taking care of an Elderly parent with dementia. That is why family members need to get help! I would like to read this book and see her perspective in how she coped with her mother. I know that a lot of people will have encountered dementia/Alzheimer’s disease in older family members. It’s a horrible disease and unfortunately it also affects younger people too. My mother suffered from dementia when she was in her 80s and it is so hard when your mother doesn’t know who you are any more, it’s heartbreaking in fact. At the same time, thankfully they, by this stage don’t know what’s happening. you have given me the want to read this book by your review. thanks for this. I have heard of this book but was scared to read it as there have been a LOT of people in my family with it, I have more memories of this nasty-assed disease than I care to think about and was afraid to read a book based on it as it would only make me sad and depressed. I’m glad to hear that it was more of a celebration of life than a book about the bad part of the disease. I’m not sure I could handle that. Maybe I’ll give it another look.